There are those films that on some primal level touch straight into your heart, and A Life on Hold certainly fits this category. Directed by Nick Francis and Marc Silver, the film tells the life of Omar, a 17-year old Somalian who’s stranded in a refugee camp since the 2011 war in Libya. When the war broke out, thousands of citizens and refugees from Somalia, Sudan, and Eritrea who were staying or working at the country during that time were forced to leave their lives. In the camps, Omar and the other refugees are left with the hope that they would be relocated to a safer place. Though it has a short run time, the story was well-delivered. Omar as the main character paints not only his life, but also the life of his co-refugees. The documentary provides a deeper understanding on situations that are remotely different from our surroundings. It sheds a more personal look at the unending war and how one’s life is trapped In between intense and shattering experiences. Technicality wise, the film is a visual treat. The scenes are artfully done. I personally like the sunset lighting; it applies a dramatic layer to the documentary. In a time where the Internet has dissolved geographical boundaries, A Life on Hold explores emotional and physical barriers. It is a remarkable story with tremendous human interest. This documentary will surely captivate and enlighten you to issues outside your comfort zones. 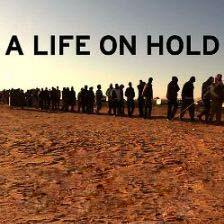 A Life on Hold is an Amnesty International Production in association with Speakit Films and Marc Silver Ltd.